You thought Jay Mariotti was the only person overly sensitive to Wikipedia criticism, but apparently golfer Fuzzy Zoeller is even worse about it: He's a law firm with an employee he believes posted defamatory statements about him on the site. Instead of suing the popular online reference site, Zoeller is taking a swing at a Miami company. In a lawsuit filed last week in Miami-Dade Circuit Court, Zoeller — suing under the name John Doe — alleged the statements were posted from a computer belonging to Josef Silny & Associates. Josef Silny, the company's president, expressed surprise when told this week by a Miami Herald reporter that the 1979 Masters champion was suing his company. 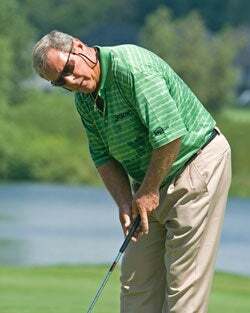 ''I think it's the most bizarre thing that's ever happened in my life,'' said Silny, who added he doesn't follow golf and knows Zoeller's name only from the sports pages. Silny's firm evaluates foreign nationals' educational credentials for clients such as the state of Florida. Later Zoeller went public with his alcoholism and prescription drug addiction, explaining that at the time he made those statements, he was "in the process of polishing off a fifth of Jack (Daniels) after popping a handful of vicodin pills". He further detailed the violent nature of his disease, recalling how he'd viciously beat his wife Dianne and their four children while under the influence of drugs and/or alcohol. He also admitted feigning a ruptured spinal disc in 1985 so as to be prescribed a multitude of prescription medication. We can't find any other reference to any of these issues other than on Answers.com, and there's nothing about in Lexus/Nexis. That makes us think someone just made it up to have fun with him. (Unless anyone can find anything else anywhere else.) We understand Zoeller's frustration, but if he's really trying to track down and remove everything defamatory about him on the Internets ... well, he's not gonna have time to play any golf.